Welcome to the New Release post showcasing projects from Our Daily Bread Designs February Release! You can see all of the February Releases here. Continue reading below to find out how you can win a $25 Gift Certificate to the ODBD Store good towards the purchase of ODBD stamps. I created two different Fancy Fold Cards using some of the new ODBD Stamps and Custom Dies released this month along with the new Heart and Soul Paper Collection and ODBD Fancy Foliage Dies, and ODBD Custom Recipe Card and Tags Die. To create this card, I cut a piece of 5-1/2" x 11-7/8"card stock, scoring at 1-15/16 and 3-15/16 from each end. I adhered the Heart and Soul Pattern Paper Collection to the side panels; Mountain Folded each end and die cut using the ODBD Custom Ornate Hears Die. I removed the half heart from each side and used that on my center panel. To embellish the pattern paper, I added two more heart die cuts, Brown Seam Binding, die cuts using the ODBD Fancy Foliage Dies, Zva Creative Mini Roses, and a stamped tag using the ODBD Custom Recipe Card and Tags Die stamped with a sentiment from the new Be Mine stamp set. To further embellish, I added the ODBD Beautiful Borders Die to the side and middle panels. 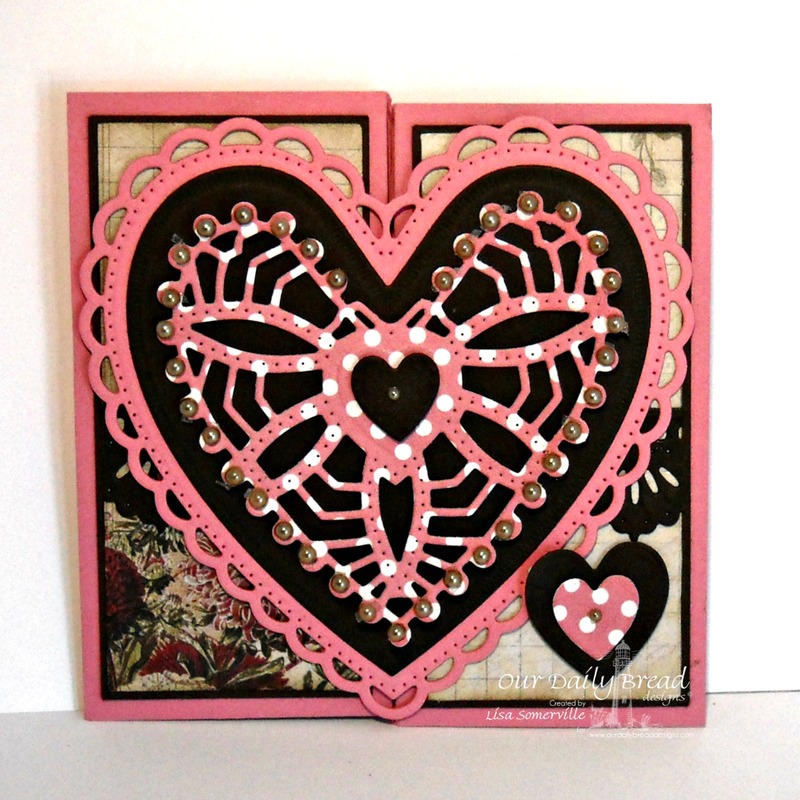 My next card features the Reverse Diamond Fold, using the ODBD Custom Ornate Hearts Die, ODBD Custom Beautiful Borders Die and Love You Bunches stamp set. Here is the open view, you can see the closed view at the top of the blog post. Here's two Mixed Media Cards I posted earlier this week on my blog as "sneak peeks" using some of the ODBD February Release stamps and Custom Dies. Details can be found in this post. Kelley will randomly be selecting 3 winners who will each receive a $25 gift certificate to Our Daily Bread Designs, good towards the purchase of ODBD stamps, just for commenting on the Design Team cards! You have until Sunday, February 2, 2014 at 9:00 p.m. EST to leave your comments. The Winner will be posted February 3rd, on the Our Daily Bread Designs Blog, so be sure to check back there to see if you are won! Beautiful samples Lisa... love the fun folds and wonderful details! Girlfriend, you have outdone yourself! Your fold techniques are amazing and I love how you embellished them! LOVE your other cards too.....such cool and beautiful techniques to them as well! HUGS!! Oh my word...these are amazing. Wow...these are amazing fold cards, Lisa. I love the other cards, as well. Thank you for sharing! These new stamps and dies are some of my favorites yet from ODBD! Lisa - your cards just blow me away!! I love your mixed media work because it's so artsy and creative - and because it's BEAUTIFUL!! But your special fold cards are also AMAZING! I made a reverse diamond fold card once and it took several days - and it wasn't nearly as beautiful as yours. You're work always inspires - thank you!! Love the folding card! They are stunning. I LOVE fancy fold cards, and you did a great job with these! These stamps and dies are so versatile! I think my favorite card, though is the first of your posted "sneak peeks", though I'm not sure I could tell you why. It just really caught my eye. All 4 cards are really nice. Lisa all these are wonderful. I especially like the gate fold and diamond fold. Very clever and lots of work on those. Beautiful all around! Very pretty--I like the fancy folds! oooh, just love the fun folds!! and beautiful colors on the mixed medias too! Well, Lisa, I can only say you are ONE creative and amazing designer! I LOVE these folded cards and am in awe of your work! Absolutely beautiful, and the two cards for sneak peeks are a delight as well! So amazed at your work and love it all! Hugs, sweet friend! This card is so intricate and gorgeous! Such wonderful projects w/ such terrific folds, Lisa! So much detail and such pretty colors and papers. Your mixed media cards are wonderful. Oh I love these. My favorite kind of cards. The more they fold the more I like em. The dies make them even more beautiful. Great job. Very neat Valentine cards, Lisa. Love the designs! Love your fancy fold and mixed media cards, they are so pretty. You have been a very busy little bee! Beautiful designs...those fancy folds are so neat, I need to try that! Pretty projects, wow!! Love the lacy die on the polka dot paper, cool effect! Oh my goodness, Lisa...those fancy folds are jaw dropping gorgeous! Love, love, love them all!!! Both folds on the cards are just fantastic, such lovely embellishing on both! Wow, those fancy folds are wonderful. Beautiful. Wow how Beautiful. love all the cards the details and styles are Amazing. the choice of colors and papers are perfect. the new dies and stamps are super delicate and very Romantic. thanks for sharing. Wonderful cards. Love the Reverse Diamond Fold card, great colors. wow! love all your projects!! very pretty!! The stunning fancy fold cards pack such a WOW factor, but my fave are still your mixed media creations! Love them all! Wow! Such fun, creative and beautiful cards! I love the color combinations. What beautiful designs Lisa!! I just love all the folds and combos of papers and details!! I especially love the mixed media and the bright pink against the black. Wow, you are the Queen of Fold Cards!! Awesome! Love the mix of stamps, dies and papers!! Lisa, I love your card because it is so different from everyone else's. I love the colors and the paper you used. Beautiful card. Wonderful job! Unique and beautiful. I am inspired. Gorgeous, Lisa! I am always drawn to your folds and wonderful techniques which always inspire me! Love the texture and layering design on each of your beautiful projects! Fabulous release creations! Hugs! Oh wow Lisa! You outdid yourself. Gorgeous catds using tbese dies. I also love your creative folds. 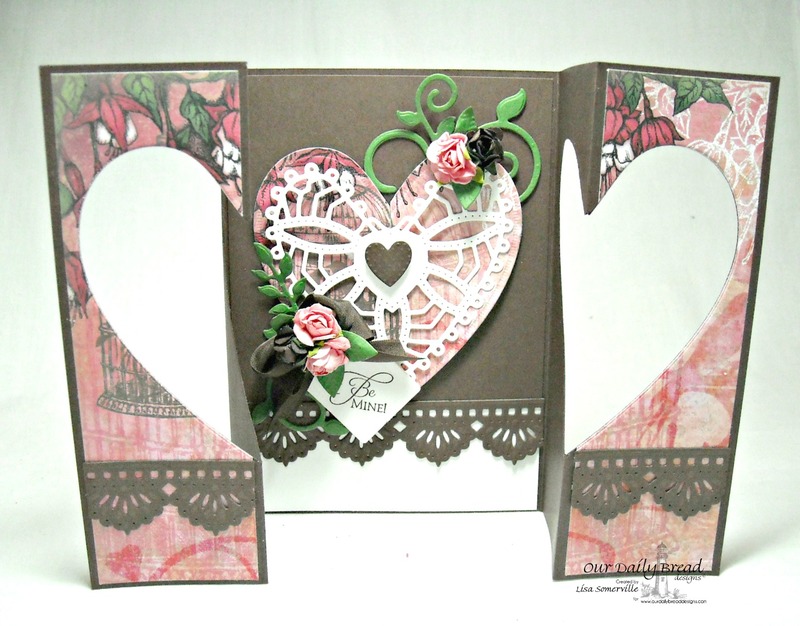 I love the mixed media card and the colors you used. Its one of my favorites. I love making fancy folds and your cards are absolutely gorgeous. The new release is one that I'll have to have! Very pretty fancy fold cards! The big reverse fold is amazing! Oh my. Lovely. The other 2 have such very soft pretty colors they make you feel spring. All are great cards!! oh wow, these are so beautiful and such details. Great folds!! I'm in awe of these stunning fold designs! The are absolutely picture perfect with gorgeous details! Appreciated your video w/tips on the blog! Oh my goodness, Lisa. What a wonderful selection of samples. I am loving the creative folds cards! This is the most beautiful release! Wish I could win it! Hey Lisa! Oh WOW! I am so in love with your fancy fold cards!! Got to enjoy some of them at the show this weekend! These are so very beautiful!!! Lisa, your samples are beautiful...love all of the different looks, but the fold card definitely has the *WOW* factor!